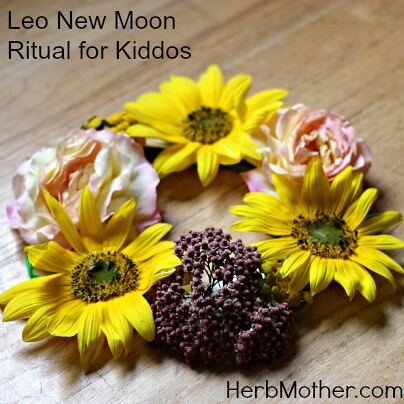 Flowers and Fire A simple Aries new moon ritual for kids. Gather: a small heat proof bowl, a short votive candle, something to light it with. Place the candle in the heat proof bowl and light it early in the day. 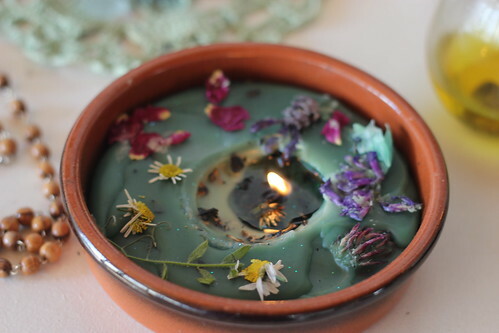 As you light the candle, pass the bowl (or if they are too little, let them stand in front of the bowl) and offer gratitude for signs of spring, a trip outside for careful observation may be useful. Please do test it yourself first to be sure you feel it is safe. It should be fine, I've done this with my children since they were younger than two with careful guidance. It is also a wonderful time to talk about respecting the magic and power of fire, a great tie-in to Aries. I've been thinking about this moon ritual all week. Well, all month really. But only just thinking. With no inspiration jumping out at me. Until last night. When I walked out to see her almost ripe behind the branches of our ancient oak tree. It was the first time in this cycle, I took the time to stop and notice her. Ritual doesn't have to be complicated or even full of witchy well-thought out meaning. For our family, is about slowing down to notice things. Notice moons new and ripe, notice flowers that some call weeds, notice silver minnows against the bright morning sky that think they are little birds. To pay attention to the wide and wonderous around us. There is beauty in the world, we just need to notice it. This full moon is called the Pink Moon and the Egg Moon. I'll leave it to you to research the legend of the names. And I hope you do, it is a fascinating study of the first peoples and how on every part of the globe they *Noticed* the world, so much more than it seems we do at times now. 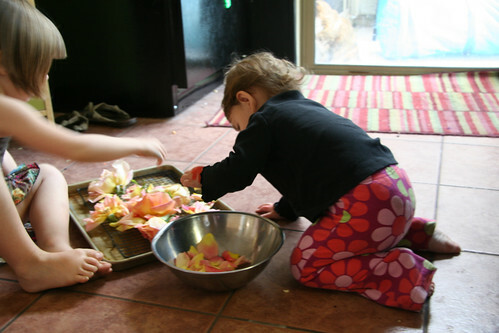 And if you are a homeschooler, it is a perfect way to find a spontaneous lesson for the day. Here is a super fun and simple craft you can do tonight. 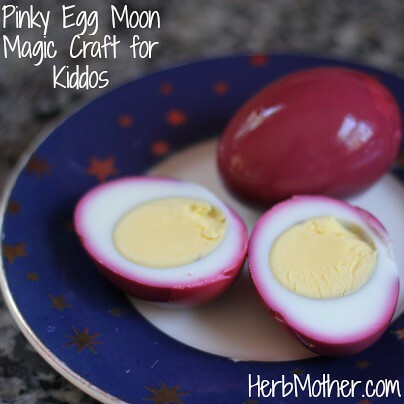 Pink Moon Dyed Eggs Make a tea with 2 tb hibsicus flowers in a quart size jar of water. Boil the water, cover, steep, then strain. Hard boil a few eggs, then peel. 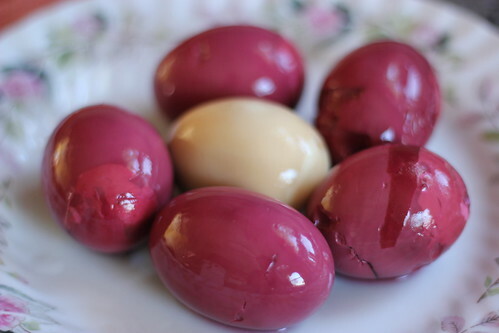 Place eggs in a glass bowl, cover with tea. 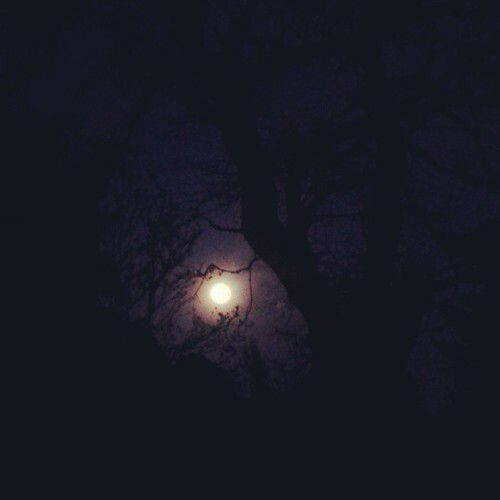 Set eggs out under tonights Pink Full Egg Moon. In the morning, she will have imparted her magic into your breakfast. P.S. Don't forget to enter to win the giveaway for the wonderful ebook Wildly Nourished. Winner announced tomorrow. Today is the Leo new moon! 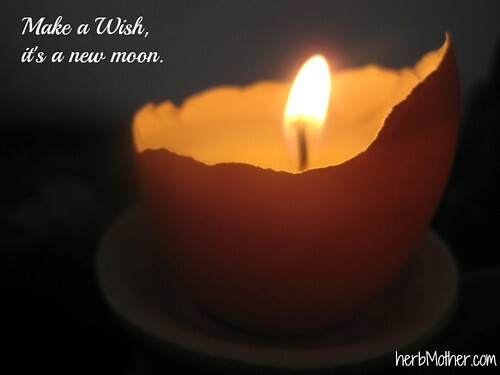 We are bursting with loads of new moon energy at Sunflower House lately. Here's a fun ritual to do with your wild bunch today that combines a bit of wishcraft and herbcraft molded into a gratitude practice. Yes friends, we might have just covered it all! ;) We just introduced our 5 year old to vision boarding, well actually she saw ours and asked to make some of her own. I am absolutely thrilled to be sharing one of our favorite intention and goal setting tools with the children. They really love it, and it never even occurred to me to share with them! In honor of the playful, joyful sun-child Leo, we'll put on a wish-mane and sing up what makes us happy to invite more of it in to our lives. Leo helps us remember the light that brings us unbridled joy. Ask the children gather up as many yellow flowers as they can find. Add some orange and whites, maybe some straw or dried grass to fill it out if you need/want to. Cut the center out of a paper plate. Have the children write or cut out words and images from a magazine and coloring books about the things that make them feel joy-FULL. Tape (we love double stick tape) or glue the words and images around the plate's remaining edge. Then using whatever means necessary: Elmer's glue, hot glue gun, duct tape, double stick tape, poking holes and threading the stems through etc, add the flowers that were collected earlier on top of the words and images. Poke a hole on both sides of the plate with a pencil and thread a string through so it will fit around the back of the child's head. You may need to double up your plate if the flowers are heavy. 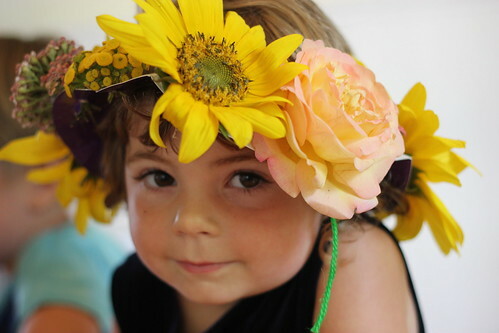 We intended to wear it like a lions mane but a fancy hat on top the head and a lei around your neck (this works great for the littles) proved to be much more practical and comfy. 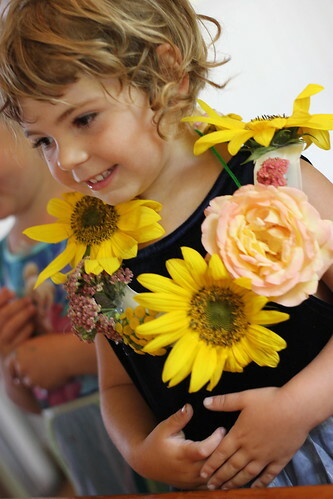 Dance wildly to your favorite sunny songs wearing your flower mane. We'll be listening to Follow the Sun by Xavier Rudd. Make a joyful noise. Let your light radiate. Offering myself a moment to process and sensually experience fall by *noticing* the subtle change, is important to a healthy seasonal shift for me. Sage Mother Spiritual Bath RitualFirst prepare your bath salt. Give yourself the gift of a 5 minutes in the shower. Before you turn the water on, pour the bath tea over your head and body. In spiritual bathing, like when we make flower essence, we keep the energy our bodies carry out of the healing waters and instead let them wash over us. You may then choose to take a bath or a shower or simply let the healing waters wash over you. Next prepare your tea. As you sip your tea, you may choose to journal, sit quietly on a couch watching nature, help your children to bed or any other activity, intentional or otherwise. Let the tea serve as an extension of your release as a sensual reminder of your time in the shower. Honey Sage Blessed Mother Bath In a small bowl combine 1 cup of dead sea salt. Sea salt or epsom salt will work as well. 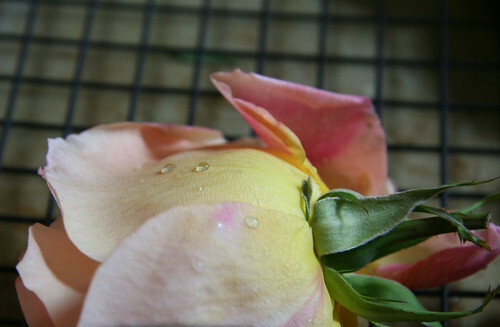 Sprinkle some dried roses into the salt. As you sprinkle in the roses, think of the Blessed Mother and the unending, unconditional love she has for you. Next sprinkle in some dried sage. As you sprinkle the sage think of the constant sun, who rises each day to offer you warmth and nourishment. You may add essential oils instead or in addition to the herbs. A few drops will do. 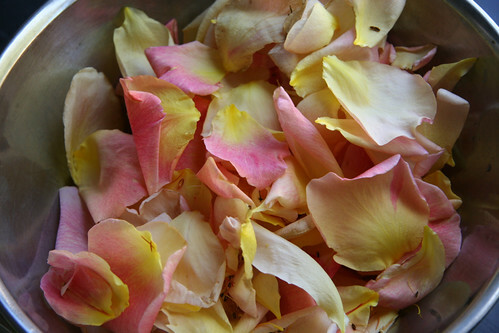 Crush the salt and herbs together to release the scent and crush your worry, and exhaustion, and business and any other thing you may be carrying and allow the rose and sage to infuse into those things that do not serve with their abundant love and light. With gratitude to the bees as symbols of community and connection we hold with all things, add 1-2 TB of honey and stir the mixture together. Scoop bath salt into a cloth bag or sock. (You can place mixture directly into the pot, but you will have to clean the herbs out afterward). Place it in a pot of water and bring to a boil. Let the herbs infuse for 10-15 minutes, longer if you have time. Cleansing Sage Tea Cover a a few sage leaves with some boiled water. More if using fresh, less if using dried. Let your intuition guide. Use any variety of sage you like. Though many burn it in a smudge, I actually enjoy white sage as a tea. 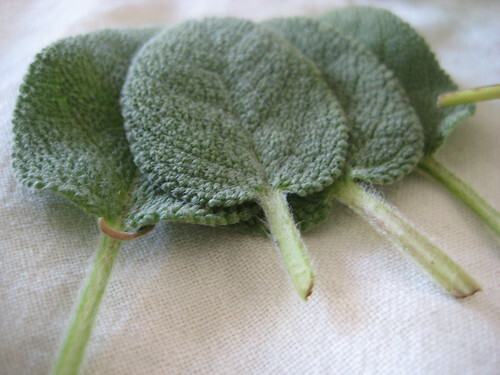 Pineapple or simple garden sage is also lovely. Allow it to steep for 5 minutes. Strain add a teaspoon (more if you need it) of honey and 1/4 to 1/2 the juice of one lemon. It is my hope that this offering will continue to build your sensory vocabulary so that when you enjoy your cup of sage tea, you can return to this feeling of love, support and surrender, even if you don’t have time for the bath. Forget about Super, for she may be close, but is never far away. Forget about Venus and her fancy retro dress. Forget about horns on goats filled with fruit. Forget about that damn mountain And the patience and work it takes to reach the top. In fact, forget about the top. If you are wanting to participate in this super charged magic, but feel like at this point you can't muster up "the right stuff" to make it meaningful: Just see her and nod. The true magic of ritual is in the art of noticing as a practice. This earth medicine stuff, it's a lifestyle. Just, start with noticing. Click for the printable Super Moon Sowing PDF. If you enjoyed this simple ritual, you will love the Sowing Circles Monthly Activity Guide. When Leslie of Comfrey Cottages shared she was doing a Remembered Remedy blog party, I knew immediately what I would be sharing. A Rosy Facial Steam. Just after my parents split up, when we moved back to my mom's family home, I spent a lot of time with my aunts as she was a newly working single mom. My mom had three sisters and 4 married brothers so it was easy to do. But my Aunt Teresa and I had a special bond the summer I turned 13. She had three boys and I think she got a kick out of spending time doing girly things with me. I never dressed up more, played with my hair more, or was just plain girlish with anyone else before or since....until now. 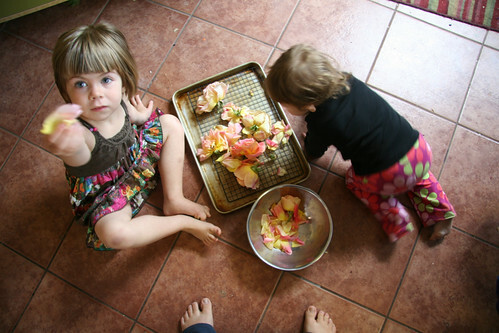 I resisted being girly with my little ones for so long. Insisting on pants only and nothing pink, only one doll in the house, absolutely no princess movies. You get the idea. I am not sure what it was, some misinformed idea about what it really means to be feminist. Fear of them not being taken seriously or having the same opportunity as boys. I guess I was a little afraid. But as my girls have gotten older, I can't stand in the way of their own expression. Sevilla loves to wear dresses, her favorite color is certainly pink, and goodness if every single thing she owns must have jewels of some sort on it. Considering how much I kept it out of the house for so long, it made me realize how dogmatic I was being about it all. So I took the lid off. Supported her choices and reflected on what it really means to be a strong woman. Being a strong woman isn't about wearing pants and shoulder pads to compete with the boys, though there is nothing wrong with this expression. My husband says the biggest trick every played on the feminist is that to be liberated you have to become more like a man. It doesn't have anything to do with loss of curves and gentle touch, emotional expression and lightness of being. The world needs all these things more than ever. Being a strong woman is to be who you are however you are. Celebrating our feminine gestures should be a part of how we are strong. Teaching our girls to love our innate gifts of gathering, loving, balancing, and costuming without shame is the road we are choosing to take. I do believe men and women are different in the way we see and build the world. Celebrating woman as she is becomes the true test of feminism. So I can see my girls in all their beauty standing tall in their pink ruffled dress removing their sparkly jeweled sandals just before they climb their beloved paloverde tree. It is with great pleasure I am able to share this remedy with them gifted to me by my beautiful aunt with great pride for our family's feminine gesture and heritage. Place a towel over your head and make a tent with the bowl. Breathe in deeply and repeat aloud: "I am a beautiful woman" until the steam cools.